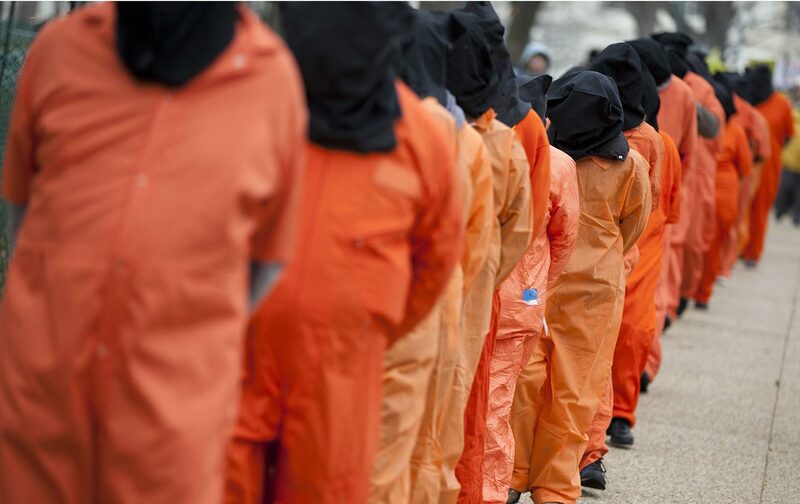 What will become of the 41 detainees remaining at Guantánamo? In the spring of 2016, I asked a student of mine to do me a favor and figure out which day would be the 100th before Barack Obama’s presidency ended. October 12, he reported back, and then asked me the obvious question: Why in the world did I want to know? The answer was simple. Years before I had written a book about Guantánamo’s first 100 days and I was looking forward to writing an essay highlighting that detention camp’s last 100 days. I had been waiting for this moment almost eight years, since on the first day of his presidency Obama signed an executive order to close that already infamous offshore prison within a year. I knew exactly what I would write. The piece would narrate the unraveling of that infamous detention facility, detail by detail, like a film running in reverse. I would have the chance to describe how the last detainees were marched onto planes (though not, as when they arrived, shackled to the floor, diapered, and wearing sensory-deprivation goggles as well). I would mention the dismantling of the kitchen, the emptying of the garrison, and the halting of all activities. Fifteen years after it was first opened by the Bush administration as a crucial site in its “Global War on Terror,” I would get to learn the parting thoughts of both the last US military personnel stationed there and the final detainees, just as I had once recorded the initial impressions of the first detainees and their captors when Gitmo opened in January 2002. I would be able to dramatize the inevitable interagency dialogues about security and safety, post-Guantánamo, and about preparing some of those detainees for American prison life. Though it had long been a distant dream, I was looking forward with particular relish to writing about the gates slamming shut on that symbol of the way the Bush administration had sent injustice offshore and about the re-opening of the federal courts to Guantánamo detainees, including some of those involved in the planning of the 9/11 attacks. I was eager to describe the sighs of relief of those who had fought against the very existence of that prison and what it had been like, year after year, to continue what had long seemed to many of them like a losing battle. I could almost envision the relief on the worn faces of the defense attorneys and psychologists who had come to know firsthand the torment of the Gitmo prisoners, some still in their teens, who had been consigned to that state of endless limbo, many of them tortured psychologically and sometimes physically. I also looked forward—and call me the dreamiest of optimists here—to collecting statements of remorse from government and military types who had at one time or another shared responsibility for the Gitmo enterprise. Some lost hope over the years as the process of challenging the detention of Gitmo’s prisoners in federal court—known as filing a writ of habeas corpus—increasingly proved a dead-end. After a couple of years in which detainees were granted release by the lower court approximately 75 percent of the time, reversals and denials began to predominate, bringing the habeas process to a virtual halt in 2011, a sorry situation Brian Foster, a prominent habeas lawyer from Covington and Burling LLP, has laid out clearly. Then, in the 2011 National Defense Authorization Act (NDAA), Congress instituted a ban on the transfer of any Gitmo detainee to the United States for any purpose whatsoever—trial, further detention, or release. If federal courts wouldn’t deal with them and federal prisons couldn’t hold them, then how in the world could Guantánamo ever close? Still others lost hope as, in the Obama years, newly constituted military commissions that were meant to try the prisoners at Guantánamo became a collective fool’s errand. Since 2002, more prisoners (nine) have died there than have been successfully tried by those military commissions (eight). And of the eight convictions they got, two by trial and six by plea bargain, four have already been thrown out in whole or in part. In other words, those commissions, the Obama administration’s answer to detention without trial, never worked. Pre-trial hearings, underway for years, in the cases still pending are expected to continue well into the 16th year since the attacks for which the defendants are to be tried took place. The chief prosecutor for the five 9/11 defendants who were brought to Gitmo in 2006 and charged in 2012, has recently—without the slightest sense of irony or remorse—proposed that their trials begin in March 2018. With appeals, they might conceivably conclude in the third decade of this century. Add it all up and you had a steamroller of beyond-ominous facts suggesting that Guantánamo would never shut down. As the last days of the Obama presidency approached, it seemed as if I were the only person left with any faith that our 44th president would keep his day-one promise before leaving office. At times, I found my own optimism disturbing, but I couldn’t give it up and, to be fair to myself, I wasn’t just stubbornly refusing to add to the negativity around me. There were reasons for my optimism, however Pollyanna-ish it might have been. After all, it was obvious that Gitmo was utterly shutdownable. After a century of tackling issues related to national security, the federal courts were more than up to dealing with whatever was involved in such cases (despite the claims of congressional Republicans). There was never any excuse for Guantánamo. By the end of the Obama years, there had been federal prosecutions of nearly 500 individuals accused of terrorism, including both the perpetrators of lethal attacks and individuals who had trained with the al-Qaeda leadership, and unlike at Gitmo, federal courts had lawfully and effectively put the guilty behind bars. Classified evidence had been handled in a way that disclosed no sensitive information and yet allowed public trials to proceed. Juries had been repeatedly convened without risk to their well being, while perfectly reasonable security measures had been taken to protect courtrooms and court officers. True, the federal courts had largely run away from dealing with the widespread abuse and torture of prisoners in the war on terror, but in the one case in which a Guantánamo detainee, tortured at a CIA black site, had come into federal court, a judge had ruled that evidence obtained through torture could not be introduced and the trial had nevertheless proceeded swiftly to its conclusion. In addition, although habeas proceedings had been yielding ever fewer releases of Gitmo prisoners, the tempo of hearings elsewhere to determine whether such individuals could be cleared and freed without trial had speeded up radically. In 2011, President Obama had initiated periodic review boards meant to identify individual detainees who no longer (or, in a number of cases, had never) posed a danger for release. Then, in the fall of 2015, he appointed Lee Wolosky as special envoy for Guantánamo closure, again raising my hopes. I knew Wolosky, a no-nonsense lawyer who had served on the national security councils of both Bill Clinton and George W. Bush, and he seemed like the sort of man who would know how to broker the sensitive diplomatic deals that would get the job done. In fact, his work would result in the release to various willing countries of 75 prisoners, nearly 40 percent of the Gitmo population Obama had inherited. By the time he left office and Donald Trump entered it, the prison population had dwindled to 41: five prisoners cleared for release who still remained there when Wolosky went off the job; 10 military commissions cases; and 26 detainees whom Miami Herald journalist Carol Rosenberg aptly termed “forever prisoners” (to be held in indefinite detention because they were considered too dangerous for release and yet there wasn’t enough evidence to bring them to trial). One more factor seemed to speak in favor of the logic of the prison being closed: the financial piece of the puzzle. The price per prisoner of keeping Guantánamo open kept soaring with each successful transfer of detainees. When Obama first took office, with 174 detainees in custody, the government was spending four million dollars per detainee annually. With 41 detainees remaining, the cost has shot up to nearly $11 million per prisoner per year. This seemed to be potentially the most convincing argument of all, but as it turned out, Congress was unfazed by the extraordinary expense. It mattered not at all that transferring such prisoners to, say, the supermax prison in Florence, Colorado, where the most notorious terrorism convicts are commonly held, would have dropped that cost to approximately $78,000 per year. And then there were those rumors that Obama might circumvent Congress entirely and simply close the prison by executive order. In fact, in February 2016, Congress rejected a closure plan submitted by the Pentagon and by July the Obama administration had decided not to pursue the option of an executive order to close the base. Above all, I knew one thing: If Obama ever actually made that decision, especially with President-elect Donald Trump intent on keeping the place open, it could be done remarkably rapidly. As I’d found out while researching my book on Guantánamo’s early days, the military unit assigned to open Guantánamo Bay in January 2002 had been given only 96 hours to put together an initial facility consisting of open cages, interrogation huts, latrines, showers, and guard quarters, as well as food services, equipment, and telecommunications set-ups, most of which had to come from the mainland. There was no reason the prison couldn’t be similarly dismantled in a few days, especially since closure would initially only involve moving prisoners and guards, not taking apart the facility itself. It was easy enough to imagine the steps to closure: speed up the review process; convince Congress that $11 million per prisoner was an unacceptable price tag; and yes, even perhaps swallow for the moment the idea of indefinite detention in the United States. Unfortunately, I wasn’t the president. As it turned out, of course, the pessimists couldn’t have been more on target. On Inauguration Day, Gitmo was still open, awaiting a new president who seems determined to fill it up all over again, ensuring that in the rest of the world—and the Islamic world in particular—the United States would forever be associated with a place into whose DNA was etched abuse, torture, and injustice. The war on terror, the forever war, would now have its forever prisoners as well. Today, Gitmo’s closure appears to be as inconceivable as shutting down the unending war on terror that birthed it. I will never, it seems, have the opportunity to compare the departure of its prisoners to their arrival, never be able to run that terrible film, that blot on our country, backwards. The legislative path is already being set for Gitmo to be eternally ours. In mid-February, 11 Republican senators wrote a letter requesting that President Trump suspend the periodic review boards and turn Guantánamo back into a prison that accepts detainees. (The last new detainee had been brought there in 2008, during the waning days of the presidency of George W. Bush.) Now, the new administration has reportedly identified its first potential new detainee in nine years. It’s easy enough to see why this is a bad idea. The backlash in the Muslim world (and not only there) will be intense and long lasting. Even a number of top-ranking officials from the Bush administration have come to this conclusion, including President Bush himself who noted that Guantánamo “had become a propaganda tool for our enemies and a distraction for our allies.” Former CIA Director David Petraeus has similarly pointed out that “the existence of Gitmo has indeed been used by the enemy against us.” Former Chairman of the Joint Chiefs of Staff Admiral Mike Mullen noted that Guantánamo “has been a recruiting symbol for those extremists and jihadists who would fight us.” Emphasizing America’s “dismal reputation,” former Republican Secretaries of State Henry Kissinger, Colin Powell, and James Baker joined their Democratic peers Warren Christopher and Madeleine Albright in recommending its closure. For 15 years, opponents of Guantánamo have insisted that its existence could change the character—and destiny—of the country. In its refusal to honor domestic, military, or international law, it has already opened the door to a new exceptionalist vision of the law. Unfortunately, Guantánamo is now a fixture of our landscape, as much an institution as new standards for the surveillance of American citizens, which means I may never get to write that piece about its last 100 days unless I resort to fiction. If I did, I’d skip all the details about the prosaic negotiations that would undoubtedly have to go on to close it. Instead, in my vision, the old-fashioned spirit of American justice and law would simply rise up organically from the body politic and reframe Guantánamo as the place of sadness and shame that it’s been from its earliest days. What I’d write would be too succinct for even the shortest utopian novel. Think of it instead as the utopian op-ed that no paper will ever publish, the one in which the desire to be lawful and a deep belief that decency and security go hand in hand prevailed. In my utopian fantasy, in the world I fear I will never see, in the American world whose absence I mourn to this day, Guantánamo will be closed not because of calculations related to its cost or the inefficiency of its military commissions or even global realpolitik. It will be closed because it’s the only right thing to do. Otherwise there will be another set of forever prisoners—and I’m not thinking about the future terror suspects that Donald Trump will send there, presumably forever. I’m thinking about us. For as long as Gitmo remains open, whether we know it or not, we’re imprisoned there, too, and so is the American way of life.